Lizzie is only the second New Line show ever that I didn't direct. While Mike Dowdy-Windsor is usually my directing wingman, this time I'm his wingman, and it's funny to both of us how completely and easily we swapped our usual roles. One result of that is that Dowdy really wants to watch every performance, to see how his show subtly evolves and grows -- that's usually me. And this time, I want to see the show a couple times, but I don't need to see it every night -- that's usually Dowdy. So I've been out in the lobby during most performances. One of the fun parts about having lobby duty is that I get to say goodbye to everybody as they leave, after the show. And almost everybody leaves this show with a smile, despite the gruesome subject matter. Some thank me for bringing this show to St. Louis. Many people tell me how great it is. A couple nights ago, one much older guy was just gushing about it on his way out. I think the intensely positive response to our show is because these four women on stage absolutely nail the rock & roll part of the equation, but they also give us really thoughtful, complicated, interesting acting. We found out recently that ours is the 25th production of Lizzie, and St. Louis is the 22nd city to host the show. You can see video of many of those productions on YouTube. I think what some other productions miss -- which Dowdy and the actors really get -- is the profound, complicated emotional heft of this story. But that's what special about this show. 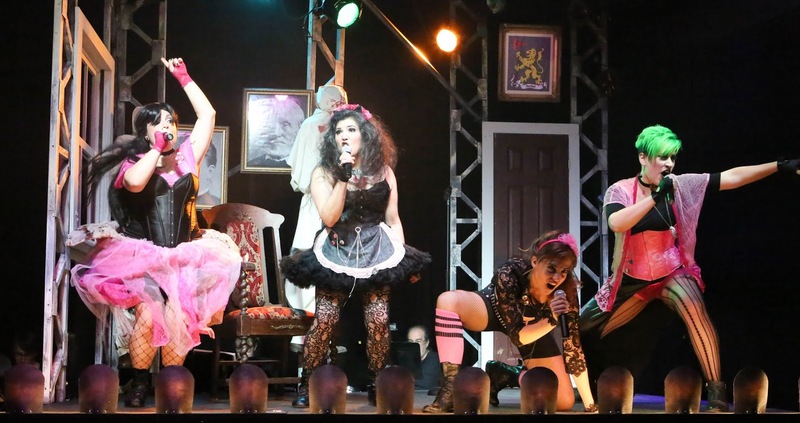 It's a killer rock concert, but it's not just a rock concert; it's also great theatre. Some productions ignore the dramatic demands of this story, opting instead for wild outrageousness for the sake of wild outrageousness. The aggressive alt-goth-punk approach to this story is vitally important, but it's not all there is here. There is also some incredibly well-written, artfully constructed storytelling, which I would argue is even more important. People come to the theatre for story. Luckily for me and New Line, everybody working on Lizzie -- Dowdy, our intrepid music director Sarah Nelson, our scenic and lighting designer Rob Lippert, our costume designer Sarah Porter, and our extraordinary cast (Anna Skidis Vargas, Marcy Wiegert, Larissa White, and Kimi Short) -- they all understand that. 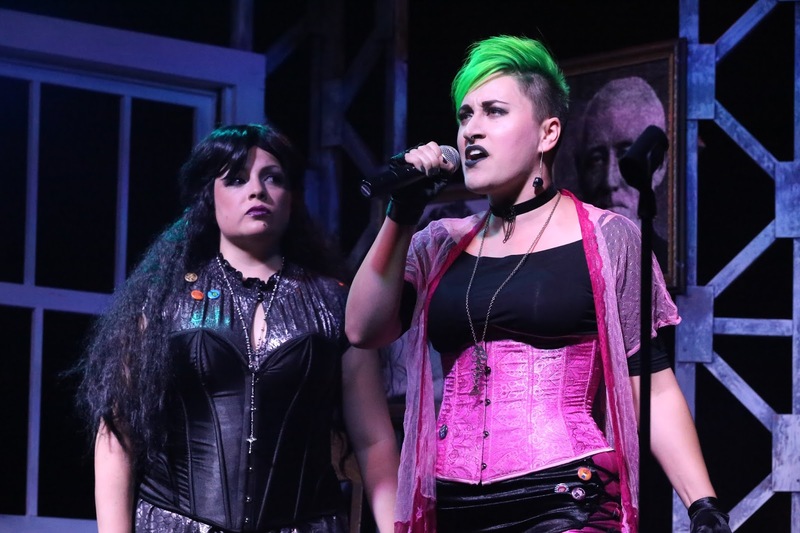 There's so much that's brilliant about the show, and I realize now it's an amazing companion piece to the male-centric American Idiot, which we produced in 2016. On one level, Lizzie is a straight-up horror story. And weirdly, unexpectedly, on another level it's a story about female empowerment, and every woman who sees it gets that. It morphs from a story about revenge into a story about justice. And that point is driven home forcefully but subtly with the use of the familiar children's song, "Forty Whacks." The song bookends the show (I love bookends! ), but at the beginning, it's ethereal, creepy, scary, because at the beginning of the story these women are powerless victims. Then the song returns in the curtain call as an aggressive punk anthem, because now the women have taken over their story, they have found their power, they have steered their own lives -- significantly, men will never control Lizzie again because now she and Emma are rich. These contrasting uses of this well-known song that frame our horror tale, define the progress of our heroes. Nobody in the audience is going to get all that consciously, but they'll all get it subconsciously. That's some really smart, subtle, exciting writing. The whole show is like that, seemingly so simple and raw on the surface, but with such rich complexity underneath. I haven't submerged myself in this show, like I do when I'm directing, but it has been such a treat to watch it evolve and take shape. I'm so proud of our production. It's everything a New Line show should be, even though I had almost no artistic input at all. This is all Dowdy's baby, and it's a hell of an awesome baby. Congrats to everybody working on Lizzie. We've hit another home run. If you haven't seen the show yet, don't miss it. We run through Oct. 21. It's truly extraordinary. You can get tickets here.